THE fattest woman in Britain told yesterday how she has not been out for FOUR YEARS because of her weight. Brenda Flanagan-Davies, who is nearly 40st, spends all day in a reinforced bed listening to the radio and buying groceries online. She eats 6,000 calories a day — three times what an average woman needs. Her only exercise is to walk 20ft to the wet-room style shower in the bathroom — a feat that leaves her exhausted. Doctors have given Brenda, 43, a stark choice — diet or die. She said: "It terrifies me, but I just can’t stop. Doctors warned my weight will kill me because I’m putting so much stress on my organs. "But food is an addiction that I can’t fight." Brenda, who gets about £300 a week in benefits, added: "I hate this life. I feel ashamed of myself that I’m even in this position. I want to help myself but don’t know where to start." She has been told her body is not strong enough to cope with surgery, such as fitting a stomach-shrinking gastric band. She has already tried weight-loss drugs and spells at slimming clubs but admitted: "I can never stick to a strict diet." Brenda — who five years ago weighed 48st — shares a bungalow with husband Ronnie Davies in Gateshead, Tyne and Wear. A care team devotes 25½ hours a week to her — costing Gateshead Council around £400. Carers help her shower, give her a "deep crease clean" to tackle the sores which develop from being in bed so much and cook and shop for her. Brenda spends around £250 a week on food. About £100 a month goes on takeaways. 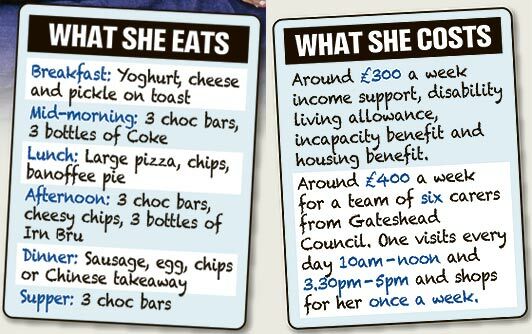 In between sensible meals prepared by her carers, she has chocolate bars and fizzy drinks from a fridge in her bedroom. She met retired labourer Ronnie, 65, six years ago at a community centre day out. But she was effectively bed-bound when he proposed in 2010, so a registrar had to marry them in a special ceremony at her home. Brenda’s last trip out was to see her GP four years ago. She said: "I struggled to get in and out of the car." On one outing in Ronnie’s Ford Mondeo, Brenda’s weight broke the front suspension. She recalled: "Eventually he wasn’t able to turn the steering wheel or change gear because my flab was in the way." Brenda piled on weight after being sent to a children’s home when her mum had depression. It got worse when she was bullied at school and began comfort eating. At 18 she was 20st and a size 18. She said: "The heavier I got, the sadder I got, so I continued to eat more." Her condition means she has barely worked — although she once had a job in a Chinese takeaway for a few months. 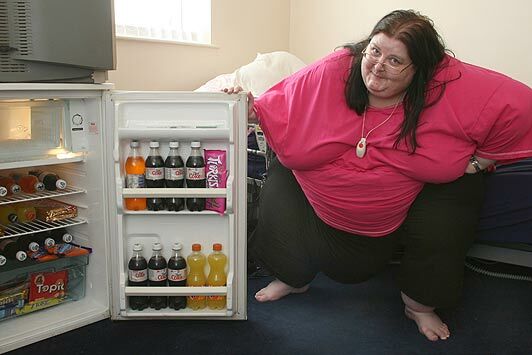 Brenda inherited the uneviable title of Britain’s fattest woman in 2010 when 45st Sharon Mevsimler died aged 41. Her story features on new Channel 5 TV series Big Body Squad on Wednesday February 29.